In 2015 while visiting The Merchandise Mart in Chicago, our designers have taken note of three exciting trends they believe are worth keeping an eye on. While these trends all fall under the category of "cabinetry", their applications extend into more than just a row of cupboards in the kitchen. 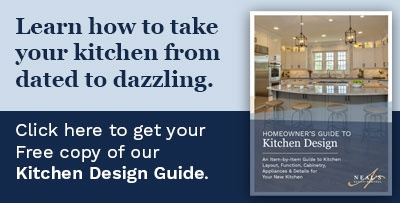 Bar design, living room entertainment centers, dining room display, and more, are all areas of the home that these new designer trends might find a place. 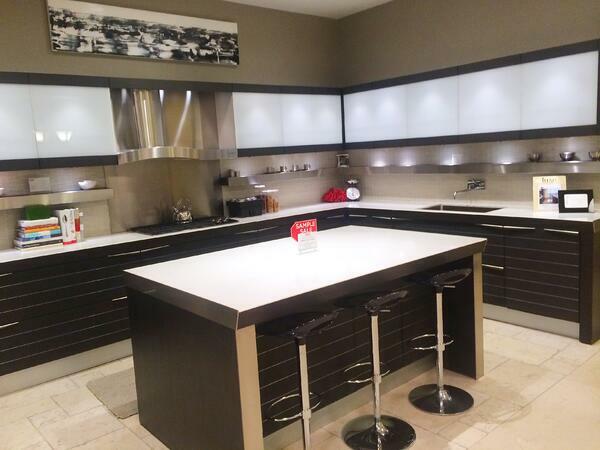 Horizonal lines in this contemporary display kitchen at The Merchandise Mart showroom in Chicago help bring a cozy vibe to the minimal modern design elements. Vertical height is always going to be advantagous, since people like tall ceilings in general, but we're starting to see spaces in which the lines of the space are oriented across the length of the room. Visually, horizontally-aligned rooms feel cozier, and more accessible, which may be a nod to the rising popularity of universal living in mainstream design. Appliances, like the new The Viking Professional French-Door Double Oven, are also getting horizontal make-overs with doors that open to the side, rather than up and down. 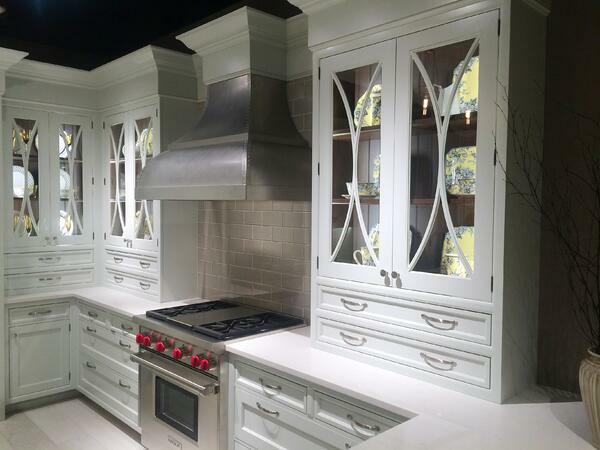 French Country dishes make a statement in these white cabinets with walnut interiors by Wood-Mode. 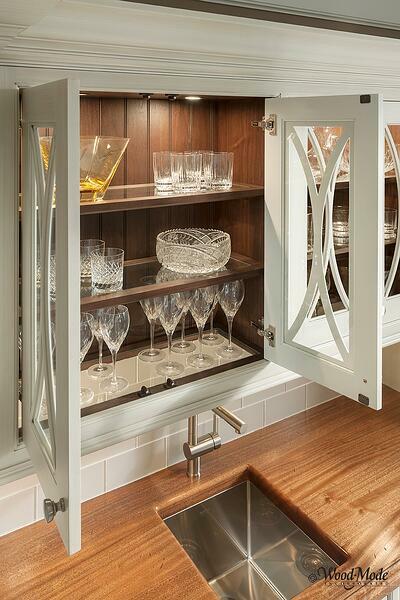 New walnut interior cabinetry from Wood-Mode fits right into the second designer trend we're noticing. 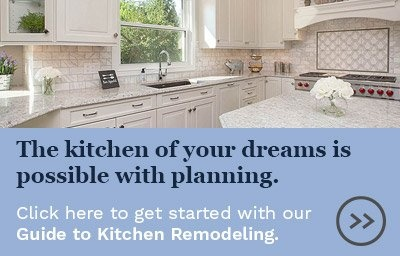 Pairing darker or colored cabinet interiors with pale or white cabinets creates an intreguing contrast. This pairing, particularly when glass-front cabinets are involved, is polished and can be a show-stopping display background. 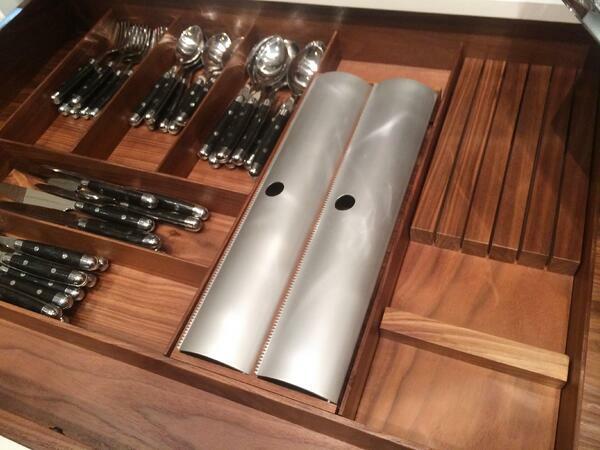 Walnut interiors can be used for any drawer or cabinet, making even your silverwear look amazing. Lighting at the top of these Wood-Mode cabinets shines all the way down, but the wood trimmed fronts keep the traditional look. Lighting has always been an important component of any successful design, and shelf lighting is nothing new, but the final designer trend we'd like to highlight is the use of special shelf lighting techniques. Glass shelves aren't for everyone (or for every design for that matter), but when it comes to lighting all the contents of a cabinet, glass is a must. For traditional spaces, consider using wood trimmed glass shelving. All the benefits of glass without needing to make a modern concession. 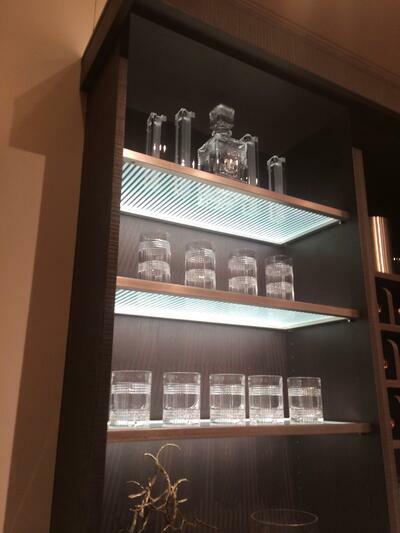 The cool green tint in these frosted glass shelves gives off a clean modern light for a wet bar. If your space is more contemporary, consider using fosted glass shelves that are lit from behind. There are several variables here, including the style of the fosting and the color of the light, but any way you go, your displayed items will get their fair share of light. The trick we're seeing with these types of shelves is to use multiples for the greatest impact.